We have created a dynamic, probabilistic atlas for any chosen stage of neonatal brain development. The atlas is created from the segmentations of 153 neonatal subjects at different ages using a kernel-based smoothing method. For any given age, an average intensity template as well as the corresponding tissue probability maps with the correct sizes and shapes of the structures can be dynamically generated. The resulting atlas provides prior tissue probability maps for six structures – cortex, white matter, subcortical gray matter, brainstem and cerebellum, for ages of 29 to 44 weeks of gestation. 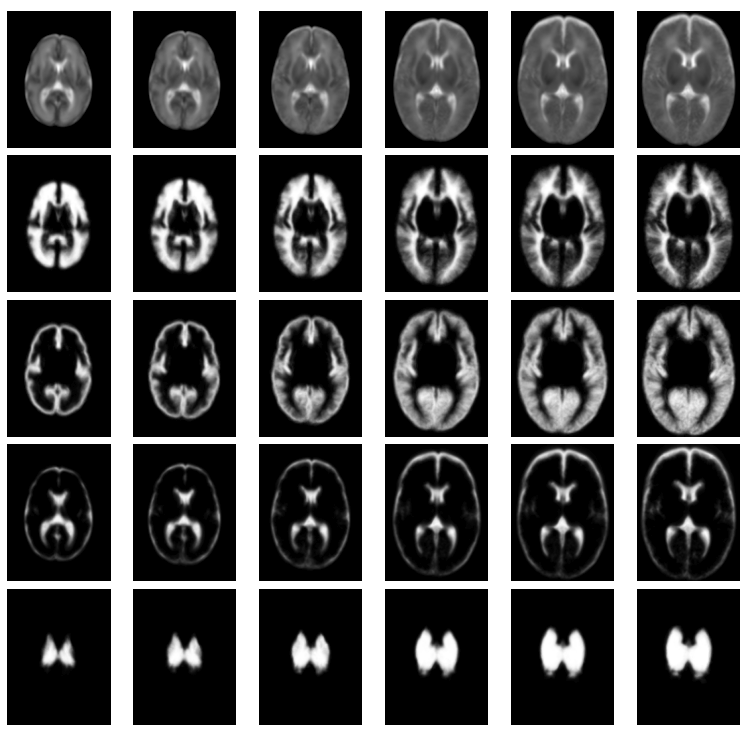 Note that all images are stored as 4D NIFTI files where time index 0 corresponds to 29 weeks GA and time index 15 corresponds to 44 weeks GA.
All 153 T2-weighted fast-spin echo images acquired on 3T Philips Intera system with MR sequence parameters TR = 1712ms, TE = 160ms, flip angle = 90 degrees and voxel sizes 0.86 x 0.86 x 1 mm. The age range at the time of scan was 26 to 44 weeks GA, with mean and standard deviation of 36.5 (+/- 5) weeks. All subjects were born prematurely. M. Murgasova, L. Srinivasan, I. S. Gousias, P. Aljabar, J. V. Hajnal, A. D. Edwards, D. Rueckert. Construction of a dynamic 4D probabilistic for the developing brain. In IEEE International Symposium on Biomedical Imaging, ISBI, 2010. M. Kuklisova-Murgasova, P. Aljabar, L. Srinivasan, S. J. Counsell, V. Doria, A. Serag, I. S. Gousias, J. P. Boardman, M. A. Rutherford, A. D. Edwards, J. V. Hajnal, D. Rueckert. A dynamic 4D probabilistic atlas of the developing brain. NeuroImage, 54 (4), 2750–63, 2011.